The following information does not constitute legal advice or legal opinion. Always seek legal counsel when you have doubts or questions regarding any legal matter. 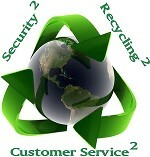 We encourage our customers to do their best to reduce their carbon footprint. We've developed an initiative we refer to as "Green As You Can Go." Simply put, we will always recommend and work with partner companies that share our green philosophy. Identity theft is a serious crime that occurs when your personal information is stolen and used without your knowledge, especially to commit fraud or other crimes. Unfortunately, this type of crime can cost the victim both time and money, in addition to destroying the victim's credit and ruining their good name. Most ID theft crimes are committed using information stolen from a single improperly handled document containing personal information. Proper document shredding is an essential step in preventing identity theft. Dumpster Diving — They rummage through trash looking for bills or other paper with your personal information on it. Skimming — Thieves steal credit/debit card numbers by using a special storage device when processing your card. Phishing — They pretend to be financial institutions, companies, or government agencies, and send email or pop-up messages to try to get you to reveal your personal information. Hacking — Thieves hack into your email or other online accounts to access your personal information, or into a company's database to access its records. Stealing — They steal wallets and purses, mail including bank and credit card statements, pre-approved credit offers, new checks, and tax info. Without our on-site document destruction, thieves can also steal personnel records, or bribe employees who have access to sensitive information. The document shredding and destruction rule applies to people and both large and small organizations that use consumer reports, including: consumer reporting companies; lenders; insurers; employers; landlords; government agencies; mortgage brokers, car dealers; attorneys; private investigators; debt collectors; individuals who pull consumer reports on prospective home employees, such as nannies or contractors; and entities that maintain information in consumer reports as part of their role as a service provider to other organizations covered by the Rule. The Disposal Rule applies to consumer reports or information derived from consumer reports. The Fair Credit Reporting Act defines the term consumer report to include information obtained from a consumer reporting company that is used – or expected to be used – in establishing a consumer’s eligibility for credit, employment, or insurance, among other purposes. Examples of consumer reports include credit reports, credit scores, reports businesses or individuals receive with information relating to employment background, check writing history, insurance claims, residential or tenant history, or medical history. Documents with such information should be kept in security bins prior to destruction. The Rule requires disposal practices that are reasonable and appropriate to prevent the unauthorized access to – or use of – information in a consumer report. For example, reasonable measures for disposing of consumer report information could include establishing and complying with policies to: burn, pulverize, or shred papers containing consumer report information so that the information cannot be read or reconstructed; destroy or erase electronic files or media containing consumer report information so that the information cannot be read or reconstructed; or conduct due diligence and hire an off- or on-site document destruction contractor to dispose of material specifically identified as consumer report information consistent with the Rule. Due diligence could include: reviewing an independent audit of a disposal company’s operations and/or its compliance with the Rule; obtaining information about the disposal company from several references; requiring that the disposal company be certified by a recognized trade association; or reviewing and evaluating the disposal company’s information security policies or procedures. The Financial Modernization Act of 1999, also known as the Gramm-Leach-Bliley Act, protects the privacy of consumer information held by financial institutions and requires companies to give consumers privacy notices that explain the institutions' information sharing practices. In addition, the act provides consumers with the right to limit some sharing of their information. In light of a series of high profile accounting scandals in the United States, the SOX Act of 2002 was put in to law as way of enhancing corporate responsibility and financial reporting, as well as combating corporate and accounting fraud. SOX is administered by the U.S. Securities and Exchange Commission (SEC), the organization responsible for protecting investors and maintaining the integrity of US financial markets. SOX applies to public companies in the United States, as well as those based in other countries that are traded on US stock exchanges such as the New York Stock Exchange and NASDAQ. SOX also calls for document shredding and destruction in interrelated businesses and industries, including the accounting, legal, and records/information management industry, which works with companies on financial and corporate reporting. Find out more at the Identity Theft Clearinghouse. The Red Flag regulations are the among the most important privacy initiatives in recent years. The heart of the Red Flag regulation is the set of document shredding and destruction policies and procedures that creditors and financial institutions must develop in order to help control identity theft. Financial institutions include any "State or National bank, a State or Federal savings and loan association, a mutual savings bank, a State or Federal credit union, or any other person that directly or indirectly, holds a transaction account (as defined in section 19(b) of the Federal Reserve Act) belonging to a consumer." Use off- or on-site document destruction to destroy personal information on discarded items. Protect your Social Security number; don't carry your Social Security card in your wallet or write your Social Security number on a check. Give it out only if necessary; always ask to use another identifier. Don't give out personal information over the phone, through the mail, or over the internet unless you know exactly whom you are dealing with. Avoid disclosing personal financial information when using public wireless connections. Never click on links sent in unsolicited emails; instead, type in a web address you know by heart. Use firewalls, anti-spyware, and anti-virus software to protect your home computer, and keep your software up-to-date. If you use peer-to-peer file sharing, check the settings to make sure you're not sharing other sensitive private files. Visit OnGuardOnline.gov for more information or ask our team about hard drive destruction. Don't use an obvious password like your birth date, your mother's maiden name, or the last four digits of your Social Security number. Keep your personal information in a secure place at home, especially if you have roommates, employ outside help, or are having work done in your home. The law requires the major nationwide credit reporting companies — Equifax, Experian, and TransUnion — to give you a free copy of your credit report every 12 months upon request. Visit https://www.AnnualCreditReport.com or call 1-877-322-8228 to access a service created by these three companies that allows you to order a free annual credit report. Contact the security or fraud departments of each company where an account was opened or charged without your clearance. Follow up in writing, with copies of any relevant supporting documents. Use the ID Theft Affidavit at ftc.gov/idtheft to support your written statement. Ask for verification that the disputed account has been dealt with and the fraudulent debts discharged. Keep copies of documents and records of your conversations about the theft in special security bins or cupboards for safe keeping. File a police report. File a report with law enforcement officials to help you correct your credit report and deal with creditors who may want proof of the crime. Report the theft to the Federal Trade Commission. Your report helps law enforcement officials across the country in their investigations.